How critical is the sand, in it's cleanliness? We have lots of sand on our place, all colors. Seems to me that if I sift it, it ought to suffice. Make sure the sand is not somehow contaminated by sea salt if you are anywhere near the ocean, there was salt water near by, or this sand had been trucked in and placed there for "fill" or something. We are in So. Ga. I doubt there is any salt in our sand. I'm going to try it. I'll let you know how it goes. Did anyone have any experience with clay in cement? Plaster in cement? I use the fine white Unimin quartz sand in the bag, it's perfectly clean, dry, free of any foreign material, it comes in 50# plastic bags. I prefer this over trucked in sand which is always wet or damp, and if dumped outside- cats, leaves and debris become an issue, if it stays there long enough you get grass or weed seeds sprouting quickly and their roots create a headache to sift out. I'm trying to move away from concrete in favor of terracotta. Clay I doubt will help anything, and likely make weak concrete, if you put plaster in concrete you essentially get USG's Hydrocal or Hydrostone gypsum cement. USG's spec sheets show that they add Portland cement to the gypsum but not the exact amount. Here's a different question. How critical is the sand, in it's cleanliness? We have lots of sand on our place, all colors. Seems to me that if I sift it, it ought to suffice. We also have red and white clay. Can I mix it into the cement to make it creamier to sculpt with? Anyone have a recipe for sculpting cement? Dirty sand might actually give you more of a paste (brittle too). Most concrete/masonry suppliers will have both Sharp and Mason sand. Mason sand is washed and round. Sharp is washed and flat and mostly used in ready mixed concrete. I’ve read through what you’re doing and I think the round mason sand mixed very poor 8-1, 12-1, and add a bonding agent (Elmers Glue) might give you more time to work. Try it without the glue too, it will be soft enough to carve (detail ??). Paint it with watered down acrylic paint the next day. let that set for a few days and stiffen/harden the sculpture with a good acrylic satin or gloss concrete sealer. Ditto what AD says about the salt. But a little clay's not a problem; most mortar mixes have some fireclay in them to impart plasticity. Sharp sand is best for building up directly; round sand flows better for casting. A little gypsum plaster will make the concrete "kick" faster, which can be helpful at times. I didn't know Hydrocal or Hydrostone contained Portland cement; if they do it can't be very much, since they act a lot more like plaster than concrete. USG's Gardenstone has quite a bit, so it lasts better outdoors. Yes, I did know about plaster, melting, in the rain over time. 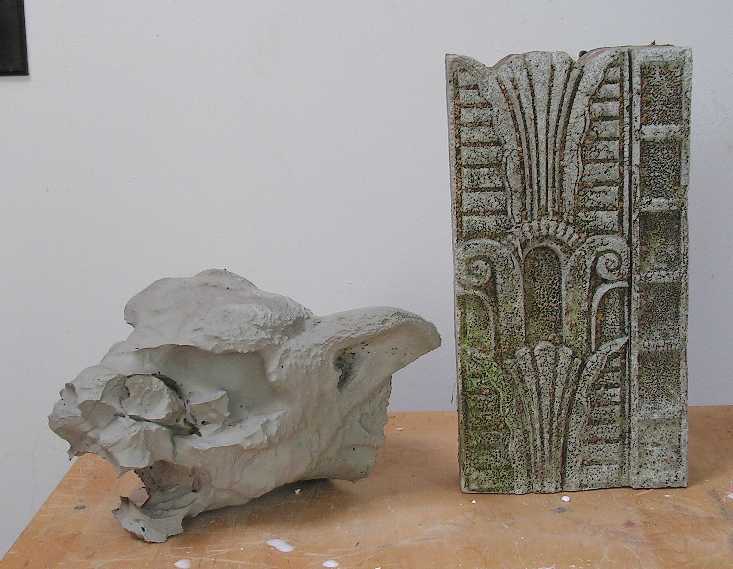 I use plaster for mother molds. I was using plastipaste but it is so expensive. I have heard that, like you say, plaster added will set up faster. I have tried many ways. It seems depending on the application and size, one can mix cement in most any ratio, to many aggregates or sand or perlite etc. As long as I let it set long enough, it is fairly strong. Do you think it is necessary to weld the rebar or just tie it on say something about 8 feet tall. I didn't know Hydrocal or Hydrostone contained Portland cement; if they do it can't be very much, since they act a lot more like plaster than concrete. Ultimately it appears the difference between those two are Ultracal has a little more Portland added to it, and they have less than 5% and 10% Portland respectively, so in a 100# bag the hydrostone has a little under 5# of Portland, Ultracal a little under 10#. It also looks like you can take Plaster of Paris and add up to 10% Portland to it at home, more than that and I guess it acts more like concrete- taking hours to set up and days to fully cure. Ive used hydrostone and ultracal, they stay syrupy liquid and then suddenly and rapidly harden up, very unsuitable for hollowing out a large cast since they have almost no plastic stage where you can work and mold it. That makes sense, about the Hydrostone. Whether to weld or just tie the rebar really depends on the configuration of the armature you're trying to build. If it's pretty simple, tying can work, but as things get more complex and the forms more extended, it helps to be able to weld the connections. We are about to buy a welder. Any suggestions? If you are mainly wanting it to weld armatures together I would suggest looking mostly at MIG welders. These tend to be the most convenient for assembling complex structures, especially if you are doing a lot of tacking and welding of relatively thin rod, bar and plate. It's also the easiest process to learn for most people. I would stay away form the very cheap end of the market but there is also no real need to spend a lot on a big brand industrial model either. A good general indicator of quality is the duty cycle, and check whether figures quoted are at the maximum operating power. 160 to 180 amps should be more than adequate for most jobs as long as the duty cycle is ok. Something like 35% or more at full power is fine. Beware that some of the cheaper manufacturers quote duty cycle figures in a way which, if not factually incorrect, is a bit misleading. Models with digital control which automatically matches the wire speed to the voltage is useful and saves time but is not essential and in general inverter based machines tend to be a bit easier to use than transformer based ones. In terms of buying I would look at specialist welding suppliers rather than the more general purpose tool retailers. A stick welder is the other alternative and they do have the advantage that you don't need to worry about gas bottles, and are a bit cheaper to buy and run, but for the type of work you are talking about they are likely to be less easy to use, especially if you're not an experienced welder. Something else to look out for is the ability to reverse the polarity, this allows you to use flux-cored wire which behaves in a similar way to stick welding. It tends not to be as neat or easy to use as gas shielded welding but can be a useful standby if you run out of gas and performs better outdoors (as well as making the machine more portable) and copes better with welds where it is impractical to properly clean the joint. You can now also get multi-process machines which will do MIG, stick and DC TIG in one package (although in some case you may need additional accessory kits to get the full functionality). These are worth considering is you think you might do a wide range of different processes but are a bit more expensive than the single use machines of equivalent quality. It can also be good to get a machine with a detachable torch assembly. The torch parts do need occasional maintenance and part replacement and this is more difficult on the hard-wired torches. But not a deal breaker is you just want an economical machine. It also makes life much easier if you ever want to weld aluminium. The high end machines will tend to have features that you won't really need for small scale jobbing work and these tend to be geared more towards increasing productivity on industrial production rather than actually producing better welds. Personally I would go for a mid-priced inverter based machine from a reputable brand, with MIG welders it is definitely worth spending a bit extra to get a decent mid priced machine as opposed to the budget models. Last edited by Chris_Johns : 12-31-2014 at 09:15 AM. Thanks Chris. All good information. What do you suppose a mid range welder should cost. It will also be used to weld on farm equipment. Not big jobs but not piddly either. In UK prices I'd expect to pay around £400-£500 and pound to dollar prices equivalents often work out at around 1 to 1. That one can also be used as a stick welder which might come in useful for farm repair work.